1. Take Taipei MRT Songshan-Xindian line (the Green line) to Gongguan station, Exit #2. 2. Once on the ground, turn left and walk for 50 meters. Meanwhile, you will see the Just Sleep on your left-hand side. 3. 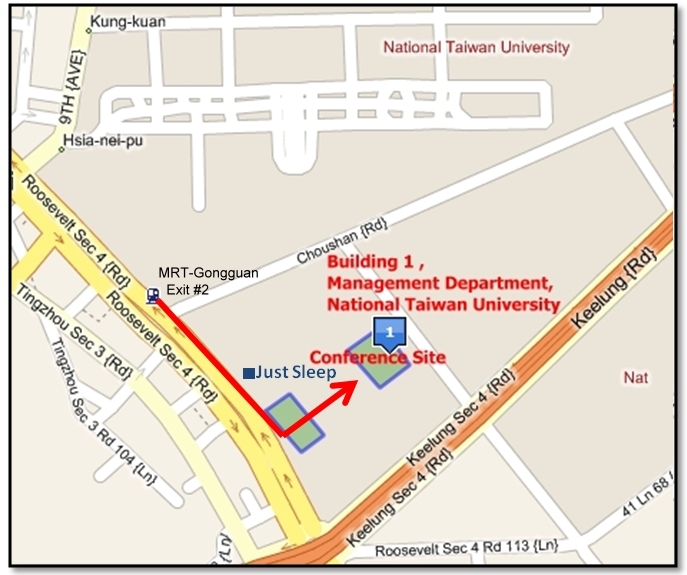 Building 2, College of Management is located just next to the Just Sleep. 4. Enter the gate of Building 2, walking straight across the lawn to arrive at Building 1, College of Management, National Taiwan University. 5. Our conference site is located in Building 1, College of Management. This memorial hall was built in memory of Chiang Kai-shek, the first president of the Republic of China. Work on the hall began in 1976, a year after President Chiang passed away. Design by C.C. Yang, who was also the architect for The Grand Hotel, the memorial hall is white with a blue roof, representing the dominant colors in the ROC flag; while the emblem of the Chinese Nationalist Party (KMT) adorns the vaulted ceiling. Ximenting is the mecca for youth culture. From tatton street to Wannian Plaza accessory shops, cosplay to street dancing, Ximenting offers a venue for youths to express themselves. Pop stars often come here for promotional events on weekends. The Lungshan Temple houses hundred of statues of Buddhist, Taoist, and Confucian deities. The temple mixes traditional Chinese siheyuan ("four-building courtyard") with palace architecture in its design. They represent the pinnacle of mosaic art in Taiwan. The temple has been declared a Secondary National Heritage Site. The Shilin Night Market is one of the well-organized and most popular night markets. It is separated into two major sections. One sector covers the streets surrounding the traditional Yangming Theatre and stretching to the Chicheng Temple on Danan Rd. The other sector is a centralized food court serving a wide variety of snacks that attract large crowds. At the Shilin Night Market, visitors can shop from store to store and have a large selection of clothes and accessories that they can bargain for reasonable prices. Known as the "Manhattan of Taipei," the Xinyi Shopping District brings together upscale malls, Eslite Bookstore, cinemas and all manner of international cuisine. This is also a great spot to enjoy the evening view and pulse of Taipei. Dihua Street Section 1 south of Taipei Bridge is the go-to place for all of your Lunar New Year shopping. This street is part of the historic Dadaocheng area, an early commercial and trading center of the city as far back as the late Qing period. In addition to New Year's supplies, there are a number of stores here selling tea, Chinese medicinal herbs, and wholesale cloth. The street has also lovingly preserved its old world charms over the years.